RC Radio: Strength Tree, additional comments. Spiritual strength is the ability to overcome difficulty, not with force or physical action, but with will power, integrity, love, and harmonious purpose. The universe was created by a combination of love and will. The love for creation and the will to push it into creation. This combination is true strength. It is the only kind of strength that does not create negative karma or disrupt the harmony of others. The average person does not know about spiritual strength. Oh they know very much about physical strength and strength of their thoughts, wants and desires. But often care very little for how they wield this reality creating power and in what manner. But on the spiritual path, it is important to wield not just any kind of strength but spiritual strength. Spiritual strength is patient and embedded with love and this energy is applied over time. It is often the only way move stubborn blocks from your life. Without patience and love, strength can become a bull and not a lion. When creating your world and wielding your spiritual power it is important to use the lion form of strength. 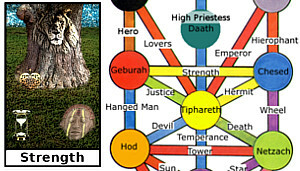 The “Strength Tree” is located between in the Tree of Life between “Geburah” and “Chesed.” Geburah adds strength and Chesed adds the energy of obedience to the laws of the universe. This fusion creates the "Strength Tree" location. It is a place where you can learn how to wield your strength in harmony with the creation of your reality. The central component of this place is the strength-tree. 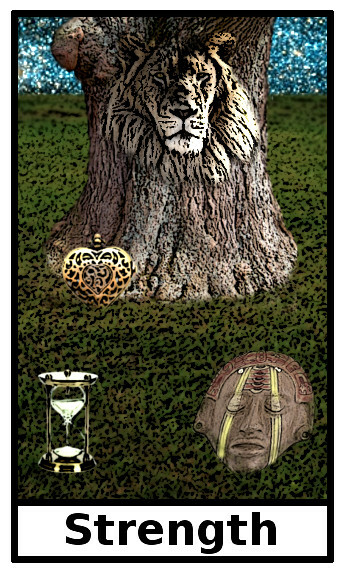 If you place your hand on the strength-tree, you will gain spiritual strength and courage to help you forge ahead in your journey. The spirit in the tree can even talk to you giving you wisdom. There is a bench here you can sit on and meditate for a bit. Sitting on this bench will reveal to you what it is you are working on right now in your life. In the tarot place “Infinity Valley” you learned about your entire spiritual journey, what you set out to accomplish in this lifetime. Here you learn what piece of that puzzle you are currently developing. It is important to know the overall goal in life, but equally important to know the short term one you are working on. It is by the small steps that you reach your larger goals. This place helps you with the small steps. There are two other things you may come across here. If you see an animal, this animal represents your opposition to your spiritual journey. It is what fights you and holds you back. The animal is not evil, in fact it is just a spirit guide in disguise helping you to understand where your opposition is. You may also encounter a “painted face” these spirit guides represent what distracts you from your goal and thus gives your opposition power over you. 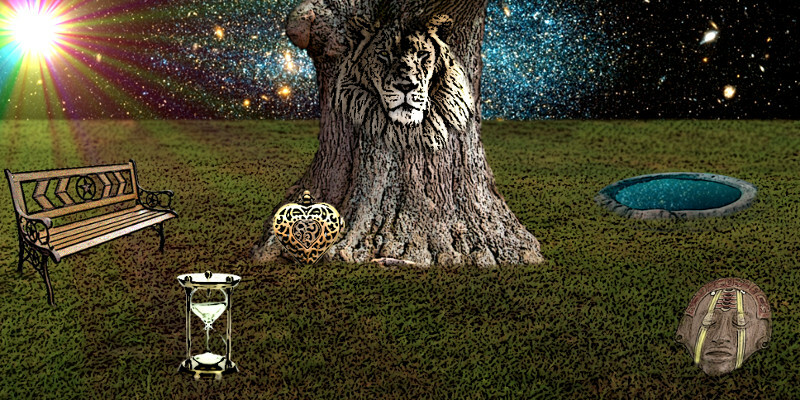 Besides the spirit inside the strength-tree, there are several traditional guides that you can meet: Hercules, Lady Nada, Sandalphon, and perhaps even Saint Germain. The one time gift here is spiritual strength: the ability to use your strength in harmony with the world around you. Other Gifts and things to do! telekinetic power: nonphysical skill to move objects with your mind (usable only when you are in the nonphysical plane).